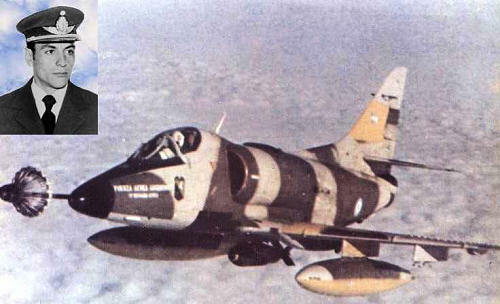 After the successful introduction of the Scooter (A4-B modified to A4-P standard, but called nevertheless A4-B by the Argentine pilots) in late 60s, the Air Force decided to buy more 25 Skyhawks, this time of the C model. The idea was to replace the F-86 Sabres in service in El Plumerillo, Mendoza. The new batch was bought in 1973/4 “as is” and a group of pilots and technicians went to MASDC David Monthan to hand pick the best planes. After being transported by ship, in utmost secrecy they were checked and improved by the own Air Force in Cordoba. Out of the 25 planes, only 6 were able to get their AN/APG-53 radar fixed. The planes were also certified to fire Shafrir missiles. In December 1975 the first plane flew in Argentina. C-313 was incorporated in 1976. During the 1978 crisis with Chile, the Argentine Air Force sent several squadrons to the Patagonia. Both Air Forces would prod the other by flying missions to check the time to response to an incursion, by crossing the border and entering the “enemy” airspace for some minutes. The A4-Cs based in San Julian took part in at least 2 of such missions, including one when 4 Skyhawks penetrated the Chilean airspace and flew West to the Pacific Ocean and turned North parallel to Temuco, Valparaiso and Vina del Mar, when they turned East again and returned to Argentina. Two of those pilots would later fight in the 1982 war in one of the Dagger squadrons (Piuma Justo and Puga). In fact, Gustavo Piuma Justo as head of Operations of the Charlies flew two of those missions in 1978. In 1982, after the actions of April 2nd and when it became clear that the British Task Force was on its way to retake the islands, the 1st Squadron was sent to Patagonia. Again, like in 1978, they were based in San Julian. C-313 arrived with the second group on April 10th. Preparations, practices and reconnaissance flights to the islands (to get used to the new environment as the Air Force was not trained to fly missions over the sea, that responsibility being the Navy’s) took place during April, the Squadron becoming ready for action during the last days of the month. After the first actions on May 1st, the Argentine Air Force South (Fuerza Aerea Sur -FAS), led by Ernesto Crespo, decided to counter attack the ships in the area around the islands. In order to improve the chances of success, several CAPs were sent, along with several missions flying low to attack the ships. The CAPs were supposed to saturate and attract the British CAPs, in order to free the low flying attack planes (Daggers, Canberras and Skyhawks). It’s a not very well known fact that there were CAPs flown that day by the A4-Cs. For these, they used as armament their Shafrir missiles (roughly equivalent to the Sidewinder B). Again, it was well understood that they had little chances against the better-armed and more maneuverable Harriers, but the idea was to saturate the British defenses. OF 1103: Lt. Jose Vazquez (C-313) and Capt. Atilio Zattara (C-304), call sign Pampa. San Julian, in flight refuel, Islands, San Julian. OF 1106: Capt. Eduardo Almono (C-322) and Ensg Carlos Codrington (C-325), call sign Pampa: The leader had problems with his VHF and fuel not being transferred from his tanks, so the mission was aborted. Though they were experiencing these technical problems, their mission was successful in terms that they lured a British PAC, got chased by it and thus forced it away from the main action. OF 1174: Four A4-C, call sign TRUENO. One British bomb of 1,000 lb each plane, led by Capt. Jorge Garcia, his wingmen being Lt Jorge Farias, Lt Jorge Casco, Ensign Gerardo Isaac. They took off from San Julian. When trying to refuel from the KC-130 tanker, Trueno 1 and 4 had problems so they turned back. Trueno 2 and 3 kept on flying, as their refueling was successful. Meanwhile, other missions were aborting due to the solid cloud cover that was not allowing them to see the surface of the sea. Now Casco took the lead, followed by Farias. They descended into the clouds, looking for their targets. In such conditions, they should have returned to base but they were too eager to press the attack. They flew under the clouds, into showers and fog. They asked for an update of the position of the ships (“Where are those d… ships!”) and they were answered that they were farther East. So they kept on going. But the problem is that they had descended too early and without knowing it, they were in the area of the Salvajes / South Jason Is. On top of this, the radar in the islands was not able to see them as they were still too far to the West, flying too low. With very bad visibility, Casco flew his plane into a cliff on the West side of South Jason / Sebaldes island. Though Farias plane has not been positively found, there are indications that it might have crashed in shallow water to the southwest of Casco’s last position. In 1982, after the war ended, C-313 was found with the pilot still inside the cockpit. The plane had no trace of missile impact. In fact, the island and the cliff were between Casco and HMS Coventry. As Hobson stated in his book, though HMS Coventry and HMS Broadsword claim these two Skyhawks shot down, in fact the Sea Darts were fired at the high flying Learjets and the Truenos (Skyhawks) were still to low and to the West for the 42-22 combo to be able to “see” and engage them. C. Chant also confirms that the planes were lost due to bad weather. While a British team was trying to defuse the bomb in 2001, a fire burnt the Southern tip of the island, creating a disaster as 90% of the native Tussac Grass was lost and thousand of penguins and other birds perished. It took at least 5 days to control the fire. Lt. Jorge Casco is now buried in the Argentine Cemetery in Darwin, Soledad/East Falkland. What happened to the other pilots mentioned above? Vasquez: shot down and killed during the last seconds of the mission to attack to HMS Invincible on May 30th, mission to which he volunteered. Lopez and Manzotti: shot down and killed together in the same mission by Sea Harriers on May 21st. Garcia: shot down by HMS Coventry on May 25th while climbing to eject as his plane had been badly damaged during an attack to the beachhead in San Carlos. It’s important to mention that he was not on his way to attack the D-42 as he had no armament left and he was loosing control of the plane due to a leak of the damaged hydraulic system. His body was found in 1983, close to his dinghy, on the North shore of Golding Island, close to Borbon/Pebble island. 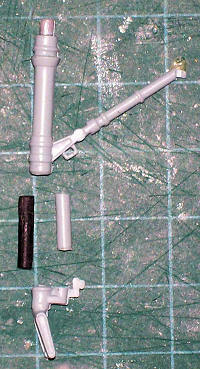 No information provided, but there are previews of various Hobbycraft Skyhawks in the archives. Ed. The Hobbycraft kit is pretty good. 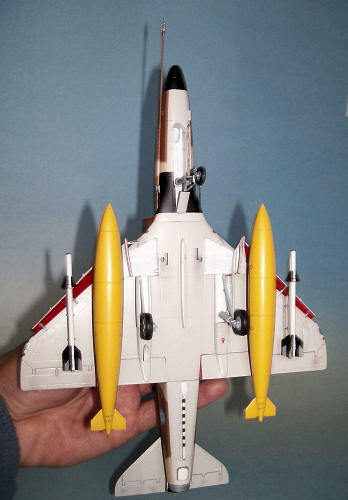 It makes a very accurate Skyhawk C. There are some minor details missing but more about that below. Fuselage: The halves were put together, with some putty and sanding here and there to have a smooth joint. The dorsal Radome supplied by HC has the wrong profile and was discarded so with a couple of layers of plasticard I scratchbuilt a new one. 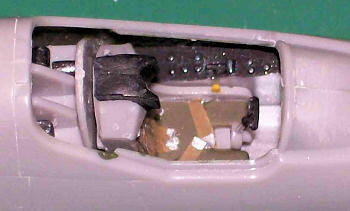 Putty was used to have a nice union to the fuselage. There is also a little intake at the front of the tail that needs to be covered with Putty. Another addition was the APX6 radome under the tail, which I made in resin. I have built so many Skyhawks and have so many more to build that I made a mold in rubber and just make copies over and over again when needed. In this case, I had to use a considerable amount of putty to get a better surface and a nice smooth union with the fuselage. As part of the preparation for later stages, I painted the interior of the air intake in white (both in the fuselage and the walls of the intake). Then the end of the intake was painted with a brush in black. With the paint dry, I glued the intakes in place. Rest of the plane: Everything went very fast from this point onwards; construction being very easy and no more fixes worth mentioning took place. The nose wheel oleo is too short as the Cs had kind of a nose up attitude while on the ground. I cut out the central part of the nose landing gear and replaced it with a longer one. All the landing gear (nose and main) was given a coat of gloss white. 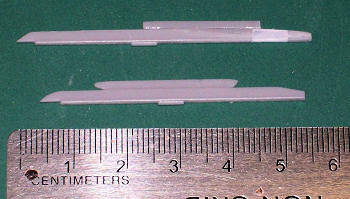 Armament: There are two types of missiles in the kit. One is fairly similar to the Shafrir/Sidewinder. The only difference is the moveable front surfaces, which are wrong. They need to be triangular. So some cutting fixed this issue. I painted the body of the missile in gloss white and then masked it to give it the black coat to all the fins (large ones with gray areas in the back, triangular on the front). The rails for the missiles are not correct for an Argentine plane. In this picture you can see some of the modifications in terms of length and profile that took place. The wheel wells were painted in white and masked. 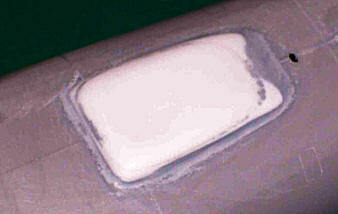 The undersides were painted in light gray (MM Acryl 4766), followed by the topsides with Sand (MM Acryl 4720). I then used BluTac to make the soft demarcation marks for the brown (MM Acryl 4707…but now I think that I should have used a less reddish brown like 4709…too late for me but take my advice if you are planning on making this colour scheme). The picture of the plane in flight during the last mission and some others of the plane earlier in her life helped me to place the demarcation lines correctly. Well, not so correctly at first. The brown on the left side of the nose had to be re done 3 times as it was first too low, then I redid it and now it was too far back. Finally, third is the charm, I got it right but not before having painted the black in front of the windshield and nose tip, which helped me to get it finally right. Also black for the dorsal Radome and area around the guns. Next came the red for the interior of the slats, flaps and the lip of the air intakes (after a very careful masking process). And finally the yellow ID bands that in this case also had a soft edge (compared, for instance, to the hard edge applied to the Skyhawks B). More BluTac. The same light gray of the undersides was used for the front half of the white VHF antenna. RLM 65 was used for the landing gear. Some worn areas of the brown paint (tail and fuselage) were created by carefully sanding off the paint (exposing the sand base colour) with 1200 wet sandpaper. With a very sharp pencil I highlighted the moveable parts and some exhausts and little intakes. Decals: a nice session of 3 or 4 layers of Future protected the colors and left everything ready for the decals. 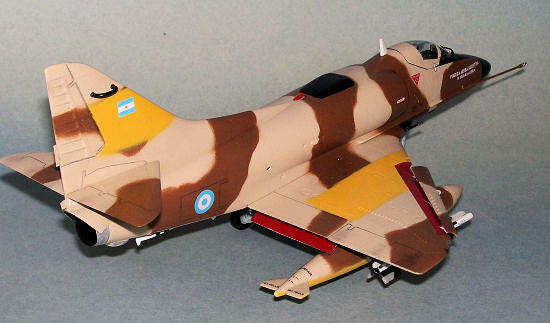 All of them came from the Argentine manufacturer Aerocalcas, except for the white “13” under the tail (in the picture barely visible) which came from the spares box. The blue numbers that identify each decal on the sheet were used as codes on the nose of the missiles. From a Mirage III EA I took a round white decal that had the perfect diameter. It went on top of the nose of the plane to resemble a cap located in that place. Then they were all sealed with a layer of Semi gloss varnish. I glued the landing gear, VHF antenna, refueling probe, missiles (with the new shaped forward fins, some decals for the red bands and a silver nose), exhaust (in black and aluminum), pitot tube, arrestor hook in black and white, landing gear doors and drop tanks. Red used for the position light behind the dorsal Radome and under the right wing. I paint under the clear part, not the surface. 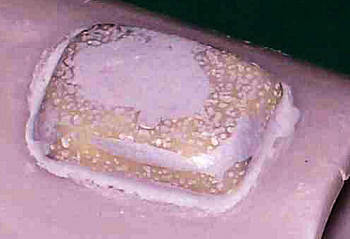 Leaving the attachment pin unpainted helps to create the illusion of having a light bulb inside a red clear cover! Windshield wiper as the last detail to complete the plane. 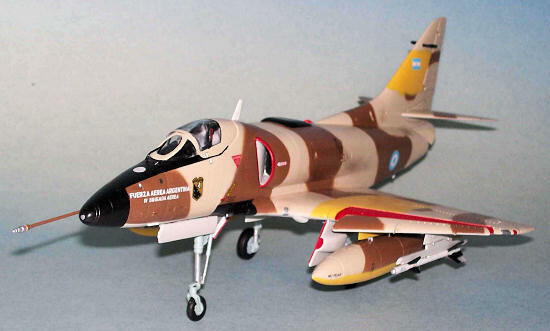 As you can see, you can fairly easy make an accurate A4-C of the Argentine Air Force in 1982. I am very happy with the result…except for the brown as I mentioned above. Hope you have enjoyed this very short but quite unknown story of the Air-to-Air role of the Scooter during the South Atlantic War. A4-B/C – Fernando Benedetto. It has a very interesting picture of a line of Cs where it can clearly be seen that two color schemes coexisted: gray and green, and brown and sand. Pablo Carballo, for his constant support and his permission to use the last picture of Casco’s C-313 refueling in flight during the fateful mission on May 9th. Allan White, for his information about the fire on the island caused by the team trying to defuse the bomb and details about Garcia’s finding.